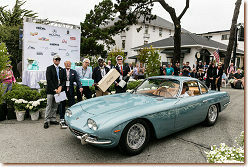 After the racing last weekend at the nearby Weathertech Laguna Seca Raceway the Concours week is now officially under way after today´s Concours on the Avenue in Carmel-by-the-Sea. Unlike all the other events during the week this is a free concours attracting the masses from normal tourists coming by chance plus those making their way from all around the world to attend the car week. For the first time this week cars will be seen on the Ocean Avenue but unlike the posh Pebble Beach Concours entrants that could be seen on Thursday the Concours on the Avenue is much more a cars&coffee meeting attracting all sorts of cars from the small Austin Minis to the American muscle cars in different classes. In the morning the cars are making their way through the crowd to find their designated spots on both sides of the closed off street to be lined up by the volunteers. Ranging over about 5 blocks the main street in Carmel becomes a free fun fair for all visitors to enjoy a variety of cars and it seemed that even more people were out this year than in previous years. Originally started years ago as a two-day event the very popular concours became more down to earth over the years refreshingly separating it from the very expensive events like the Quail or Pebble Beach itself. After the cars were set up a group of race cars from the nearby raceway were guided in by the police to wake up those who might have missed the car show by then. Several Porsches, Mustang and the featured marque Datsun showed up to entertain the spectators. Over the next hours the presentation on the ramp featured several cars from the different classes while the judges were busy to choose the winners in the countless classes. In typical Monterey weather the show started on an overcast morning before the sun was out for about 2 hours around noon before the clouds came back giving an impression of what to expect the coming days. Although one thinks about sun and heat when visiting California the Peninsula is actually quit chilly around this time of the year without the sun out, especially compared to the heat waves in Southern California or even in Europe these days. After a long day finally the Best of Show was presented in the late afternoon with the Lamborghini taking the top laurels, a car represented in extraordinary restored condition in light blue. After being awarded it was on display in front of the Cypress Inn Hotel with the other winners at the end of the day. And as long as it took for all the cars to be set up it only took about half an hour until the main street was again clear for traffic. Tomorrow will start with the numerous auction previews of the different auction companies including the big three of Bonhams, Gooding and RM Sotheby´s. Although the main attraction is still the concours on Sunday the focus is more and more shifted towards the highest valued car on sale in the entire year. Every year one could hear people complaining about the insane amount of money going over the block and every year people say this cannot last forever but for some reasons the Monterey auctions still seem to be those working the best as every year most of the treasured items are absorbed by the huge collector car market that still contains a lot of money and even the highest selling cars like the Ferrari 250 GTO at RM Sotheby´s still looks like a bargain compared to the prizes of the art market. With an uncertain economy on both sides of the Atlantic and ever changing tax regulation there are not few opinions on how the outcome will be and latest Saturday evening most insiders will tell us exactly how it came exactly as it came out. Until then, both sellers and auction houses are holding their breath as it seems to be uncertain to a certain amount no matter what people say. The first Auction to set the trend will be the Bonhams Quail Lodge sale going Friday during the day before Gooding and RM Sotheby´s join in later that day. Tomorrow we will have a first glimpse at hundreds of cars looking for a new home.